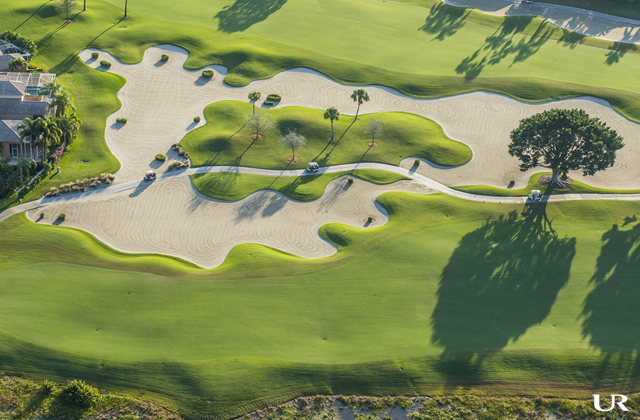 Twin Eagles has been described as “by far” the most sought after premier golf experience in the Naples area. Kudos like that make real estate here a serious consideration for any golfer. Twin Eagles homes and condos are all placed to take maximum advantage of golf views. Simply, it's golfer heaven. The sentiment regarding the golf experience here is due to the spectacular Jack Nicklaus-designed, 18-hole, championship golf courses, The Talon, and the equally impressive Eagle course designed by Steve Smyers and Patrick Andrews. Golf Magazine named the Eagle course The Best New U.S. Private Course of the Year in 2013. Gated and guarded 24/7, Twin Eagles is located northeast of Naples on the north side of Immokalee Road. Certified as an Audubon International Signature Sanctuary, Twin Eagles was recently recognized as top in its class with an award from the Council for a Sustainable Florida. The neighborhood of Covent Garden curves its way between the 8th and 9th fairways and along the west side of the 2nd fairway. There are 120 condo units built by Pulte Homes in the 30 two-story buildings on this quiet cul-de-sac. The Cheshire floor plan offers a total of 2,357 square feet, with 1,654 under air. The Tourmaline has 3,054 square feet, with 2,297 under air. The Hedgestone neighborhood of single-family homes borders six different lakes. Depending on location residents have views of the 10th, 15th, 16th or 17th tee boxes, fairways or greens. There are five different models available in Hedgestone, built by either Arthur Rutenberg, Divco, or Stock Signature Homes. The Bermuda by Arthur Rutenberg features elegant Mediterranean styling with 3,438 square feet of interior living space. Divco Homes created the La Salle with 3,616 square feet under air and a total of 5,402 square feet when including the lanai, formal entry, and garage. The remainder of the homes in Hedgestone was built by Stock Signature Homes. They include the 3,333 square foot, four-bedroom Muirfield IV, the 3,525 square foot, four-bedroom Ponte Vedra Grande, and the 3,699 square foot, Regency Manor. The latter two also feature three-car garages. The Wicklow neighborhood features single-family homes by Stock Signature like the Scottsdale II, with 2,719 square feet of indoor living space plus another 930 when including the covered lanai and entry way. Wicklow residents have three lake views and views of the 12th and 13th holes of the Eagle course. The luxury lifestyle of Twin Eagles is complete by the centrally-located, 47,000 square foot clubhouse, styled after the Manor homes of St. Andrews. The clubhouse is home to a well-stocked pro shop, a 6,430 square foot fitness center, locker rooms, steam saunas, and rooms for cards and billiards. The newly renovated, 2,500 square foot, the resort-style pool has a zero-entry access point and is situated in the center of an exceptionally large deck overlooking one of Twin Eagles’ many lakes. The icing on the cake may be the fact that the dining experience at Twin Eagles is often recognized as “one of the finest dining locations to grace Naples.” Food preparation is overseen by 2011 Naples and Marco Island Chef of the Year, Chas Tatigan, who serves up a uniquely elegant presentation with every dish. The Twin Eagles experience is a world apart, even with all that Naples has to offer. Miles of walking trails within the community make residents forget that there is life outside of Twin Eagles. However, when they do remember, all the necessities of life are nearby, including two major hospitals within 15 miles, goods and services available along Immokalee Road, and Corkscrew Elementary and Middle Schools and Palmetto Ridge High School nearby.